The greatest mysteries of all time, those of the arcane and occult sort, have met their match in the greatest detective ever known! Sherlock Holmes takes on the strangest of mysteries in Fred Adams, Jr.’s THE AFFAIR OF THE CHRONIC ARGONAUT, now available in print and digital format from Pro Se Productions! A rash of gruesome cannibal murders surrounding the construction of the London Underground draw Sherlock Holmes and Doctor Watson into a bizarre case in which reality changes without warning and Holmes faces perhaps his cleverest adversary. In a second mystery, Holmes encounters a dead man in a locked room, and the only clue a crushed piece of yellow paper. Holmes and Watson follow a twisted path of murder and political intrigue that threatens to topple an empire and leave them dead in the process. Follow Holmes and Watson as they traverse into a darkness beyond the ken of humanity in SHERLOCK HOLMES: THE AFFAIR OF THE CHRONIC ARGONAUT by Fred Adams, Jr. A Part of Pro Se Productions’ HOLMES APOCRYPHA imprint! 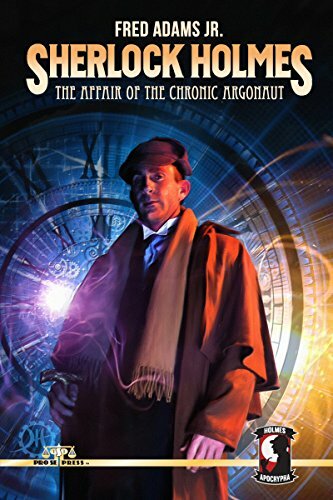 Featuring a stunning cover by Jeff Hayes and cover design and print formatting by Antonino Lo Iacono and Marzia Marina, THE AFFAIR OF THE CHRONIC ARGONAUT is available now at Amazon at https://www.amazon.com/Sherlock-Holmes-Affair-Chronic-Argonaut/dp/197397035X/ref=sr_1_8?ie=UTF8&qid=1501534485&sr=8-8&keywords=chronic+argonautand Pro Se’s own store at www.prose-press.com for 15.00. This mysterious two story collection is also available as an Ebook, designed and formatted by Lo Iacono and Marina for only $2.99 for the Kindle at https://www.amazon.com/Sherlock-Holmes-Affair-Chronic-Argonaut-ebook/dp/B074CYNGD4/ref=sr_1_3?ie=UTF8&qid=1501534485&sr=8-3&keywords=chronic+argonaut. AFFAIR OF THE CHRONIC ARGONAUT is also available on Kindle Unlimited for free to Kindle Unlimited members.